Cellula Robotics Ltd. is proud to launch a new website and introduce their first Hovering Autonomous Underwater Vehicle (HAUV): Imotus-1. Imotus-1 is a Hovering AUV specifically designed to operate in confined environments, in a range of fluids. The navigation solution incorporates Cellula’s proprietary Simultaneous Localisation and Mapping (SLAM) algorithms, using data from a suite of sensors to calculate its location inside a confined, unknown environment. Imotus-1 carries a range of inspection sensors including a high resolution stills camera, ultrasonic thickness sensors and a light intervention cleaning tool. Imotus-1 is available for purchase or lease. 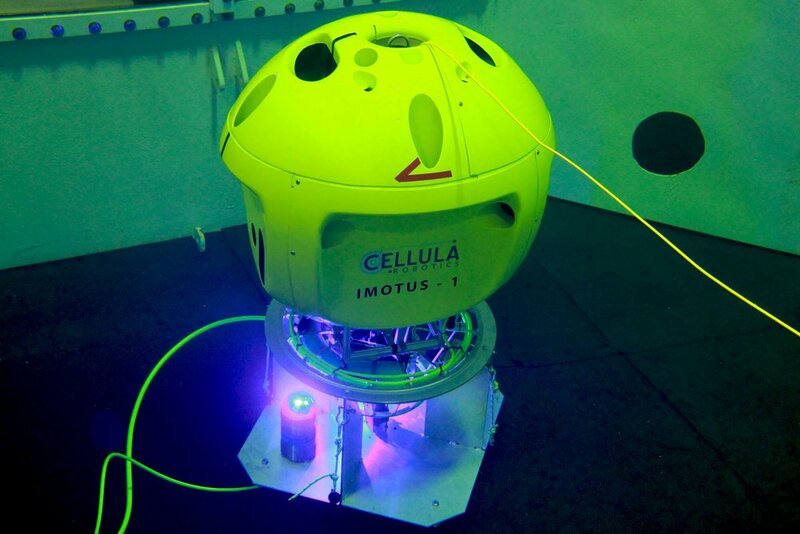 Cellula Robotics Ltd. has been awarded a contract to operate its Hovering Autonomous Underwater Vehicle (HAUV) Imotus-1 for survey and inspection work on an offshore platform. The work will be performed in January 2018 and includes an option for subsequent inspections on the same platform. Cellula Robotics Ltd. has been awarded a contract by Ocean Networks Canada to demonstrate subsea blue light communication, docking and charging of Cellula’s Hovering Autonomous Underwater Vehicle (HAUV): Imotus-1. The demonstration will occur by the end of 2017 in a confined space test tank. Established in 2007 as a major initiative of the University of Victoria, Ocean Networks Canada (ONC) operates world-leading ocean observatories for the advancement of science and the benefit of Canada. The observatories collect data on physical, chemical, biological, and geological aspects of the ocean over long time periods, supporting research on complex Earth processes in ways not previously possible. For more information, please visit the ONC website. Cellula Robotics Ltd. (Cellula) has been successfully awarded grant funding from the National Research Council’s Industrial Research Assistance Program (NRC-IRAP). The funding will go towards the development of a Simultaneous Localization and Mapping (SLAM) payload capabilities for Autonomous Underwater Vehicles (AUV) operating in confined spaces.